Can Franco-German axis save European integration? France and Germany have always played a huge role in European integration. The two former rivals signed the Elysee Treaty 56 years ago to end hostilities, which also laid the political foundation for a Franco-German axis and drove the process of integration. 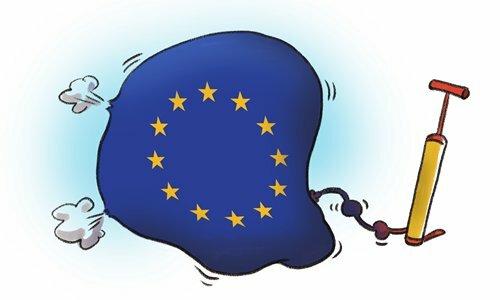 With European integration fraying at the edges, the two powers are again making efforts to mend fences. German Chancellor Angela Merkel and French President Emmanuel Macron signed the new Treaty of Aachen as a declaration of political consensus on January 22, seeking to revive Franco-German ties and inject dynamics into the integration process. The new treaty, lacking substance, is endowed with more political symbolism, say European critics. Nonetheless, owing to various domestic constraints of the two powers, this is the best that can be achieved. The treaty is aimed at building close cooperation between Paris and Berlin on foreign policy, defense and trade. It is not only a reaffirmation of Franco-German consensus, but also points at closer cooperation in mutual military assistance, industrial integration, and in-depth cultural exchanges. Merkel has already expressed her willingness to build a Franco-German "common military culture" and "contribute to the creation of a European army." Nonetheless, the treaty has been accused of evading urgent questions and practical difficulties such as the refugee issue and euro zone reform. Merkel's influence in German politics has waned; meanwhile, Macron is politically hurt because of the yellow vest protests. These factors will affect mutual trust and tell upon the efficacy of cooperation between Paris and Berlin. Apart from facing opposition by right-wing political leaders of both countries, the treaty has also faced resistance on other fronts. It was originally intended to show Franco-German unity, but ended up exposing the lack of it. In addition, critics including some EU leaders hold that the agreement is more about bilateral cooperation than European integration. Unlike 56 years ago, with development of other European countries and emergence of new group politics, the strong leadership and appeal of the Franco-German axis have gone with the wind. Since the launch of the discussion on "multi-speed Europe" two years ago, European integration has not embarked on the ideal path but has faced a new crisis. EU members have been forming cliques due to their diverse interests. The Visegrad Group comprised of four Central and Eastern European countries objects to the immigration policy. The New Hanseatic League established in February 2018 has been opposed to strengthening European financial integration. The Warsaw-Rome axis even publicly challenged the France-Germany axis. Although France and Germany hoped the Treaty of Aachen can reaffirm their leadership role and guarantee European integration, the axis is hobbled by being out of date. If the two stress too much on bilateral cooperation, they cannot play a stabilizing role but would create more divisions within the EU. The treaty is obviously aimed at sending a message to the international community, especially to major powers. Merkel emphasized the significance of military cooperation between Germany and France for building a European army, as she is concerned that the US may abandon its European allies. US President Donald Trump has asked Europe to take its fate into its own hands. As long as the two can closely cooperate in industry and defense, Europe can stand on its own feet. When Europe is internally divided, it has to project strength outside. External menace can be an incentive for revival of France-Germany axis and serve as a driving force for European integration. But a militarily unified and strengthened Europe can add a sense of insecurity to the region, and lead to an arms race or even military confrontation. It is not something the EU, France and Germany can easily deal with. Merkel believes the treaty can help France and Germany overcome differences in strategy and culture. But if Germany, which has been promoting a culture of peace, wants to keep up with France, which has been showcasing its influence through military intervention in other countries, Merkel's will and a single treaty are far from enough. Not to mention the US has already started driving a wedge in Europe's common diplomacy and security through close military cooperation with nations such as Poland.